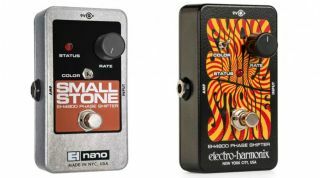 Electro-Harmonix has redesigned its Small Stone Nano phase shifter. The new look, which was first revealed on the company's website, features a powder-coated enclosure, similar to that of more recent EHX pedals like the Oceans 11 Reverb. This stands in stark contrast to the pedal's previously bare chassis. It's not yet known whether pedal's circuit changed along with its design, though we do know that the control array of the rate knob and color switch have remained the same. The status LED and color switch, however, have been switched around. To get a complete look at the redesigned pedal, head on over to ehx.com.